The test panel on the Douglas B-18, installed in 1941, was designed to test the transition in the boundary layer. 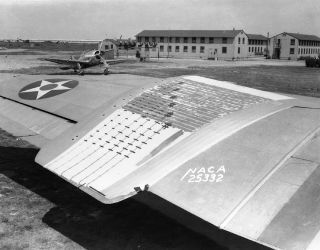 In this historical photo from the U.S. space agency, Langley installed an experimental low-drag test panel on the wing of a Douglas B-18 airplane in the spring of 1941. The panel was fitted with suction slots and pressure tubes for a free flight investigation of the transition from laminar to turbulent flow in the boundary layer. The pressure at each tube was measured by liquid manometers installed in the fuselage.